Q. I have been asked to add a signed consent form (or something similar) to be included with my Turnitin submission. How do I do this? Assignments must be submitted to Turnitin as a single document. You may have been asked to submit a scanned document as part/ all of your assignment (e.g. clinical notes, signed declaration, maths notation or fieldwork) or perhaps you need to include images in the file. If you have multiple files for different parts of an assignment, you should combine these before proceeding. Combined printer / scanner machines are available in each campus Library. These will create a PDF scan which is emailed to an account of your choice. • less than 400 pages. In this case, simply combine all documents into one, and submit to Turnitin. However, it is more likely that the assignment is set to ‘Allow only file types that Turnitin can check for similarity’. Therefore Turnitin will only accept file types that can generate Similarity Reports and the file must include at least 20 words of machine-readable text. Open the pdf document in Adobe Reader. Adjust the screen display so that the whole page, or the area you need, is entirely visible on the screen. If you have multiple pages, it’s best to repeat steps 2-4 for each page. Otherwise it will be too small. Go to the Edit menu and choose ‘Take a Snapshot’. Open the Word Document and at the right location in the document, choose ‘Paste’ command (keyboard Ctrl + V or Home menu > Paste). This will insert the pdf snapshot as an image in your document. You can adjust the size if necessary. 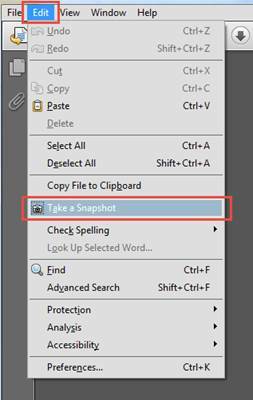 Use Snagit or another program to capture the screenshot, or open the existing saved image file. You may need to save the file as an image file (e.g jpeg, bmp, png) first. If so, save it to your Documents then open Word and choose Insert menu > Picture. Navigate to the location of the saved file and choose ‘Insert’. This will insert the screenshot / picture as an image in your document. You can adjust the size if necessary. Remember that the document must contain at least 20 words of machine-readable text – you may need to type a short introduction or include the unit and assignment details to fulfil this requirement.